Günzer Tamás is one of two brothers that make wines in Villány. For foreigners this is sometimes a little bit confusing so for easy reference I have added his given name! Günzer offers a fresh and light rosé wine, two white wines and one sparkling wine, but they are best known for their big variety of red wines both light and heavy, single grape and blends. The wine we will talk about today is a ”premium” red blend made out of the three Bordeaux grapes (Cabernet Franc, Cabernet Sauvignon and Merlot). Unfortunately I can not give an exact percentage on the grapes, due to not getting a response from the cellar. Let’s talk a little bit about Bocor, what is Bocor? Bocor is a vineyard on the slopes of the Kopár hill, one of the most promising hills in the region. Many delicate and delicious wines are made from the grapes that are grown on the Kopár hill. 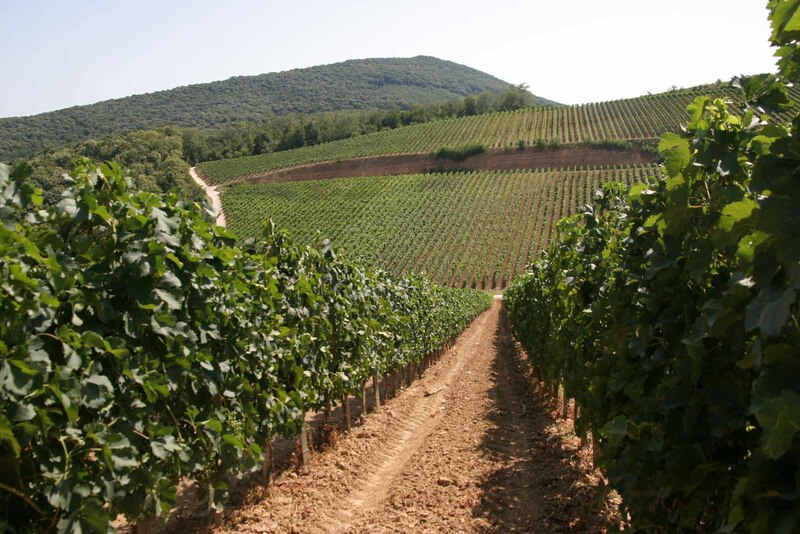 Gunzers’ Bocor vineyard are protected from 3 sides, the south part is open and has a 15-20% slope. This is the their latest plantation which they started in 2009 and first started harvesting in 2011. The Bocor Vineyards. The picture is not taken by me, all credit goes to Günzer Tamás. The wine was matured in 225 liter new barrique barrels for 24 months and as previously mentioned, it’s made out of Cabernet Franc, Cabernet Sauvignon and Merlot. Medium ruby in color and clear. A clean, complex medium(+) intensive nose with dark chocolate, charred wood and a little bit of vanilla. I think due to bottle aging there was also some tobacco in the nose. You could also feel the alcohol. The flavors corresponded well with the nose with medium intensive tannins without any dominating alcohol with a medium long finish. I also found some vegetal notes and some leather which I once again think comes from the bottle aging. I personally think that this wine is very good and has potential to age further but you can of course also drink it today! My score for this wine is 88 points. The price for this wine was 6200 Hungarian Forints, which is about 21 euros. Previous postHey man where have you been? !